The alkaline earth boro-aluminosilicate glass 1737F is highly resistant to temperature and thermal shock. It is a near zero alkali glass developed by CORNING that withstands the rigorous cycles of poly-silicon transistor processes. 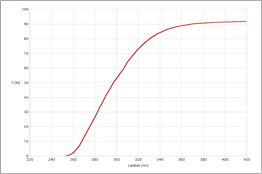 A low alkali content in the glass and its high strain point of 666 °C allow special manufacturing processes required for various electronic components that are not possible with most other glass materials. A coefficient of thermal expansion close to the one of silicon opens up the option for chip-on-glass (COG) applications. 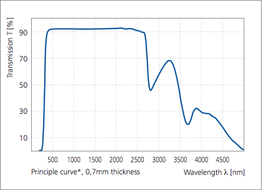 Furthermore, 1737F features an exceptionally low microroughness and an excellent optical quality. In general, the natural surfaces of 1737F glass already have a lower micro-roughness than most mechanically polished glasses. Hence, this glass is an excellent substrate choice for optical- filter or mirror coatings. Corning 1737 glass materials are more durable than their predecessor 7059 and have an even lower alkali content and less shrinkage. In most applications unannealed 1737F LCD-glass can even replace annealed 7059 glass, resulting in considerable cost savings. A newer, also almost alkali-free glass that represents an alternative to 1737F is EAGLE 2000, also from CORNING. For further technical information, please email us.